Just 15 minutes away on a tram ride, west from downtown Lisbon is the Campo de Ourique neighborhood. This area is known to locals as a foodie neighborhood, where new food concepts are tested and launched. Most visitors to Lisbon will rarely make it to this area. It is a charming “city within Lisbon” and a foodie paradise. 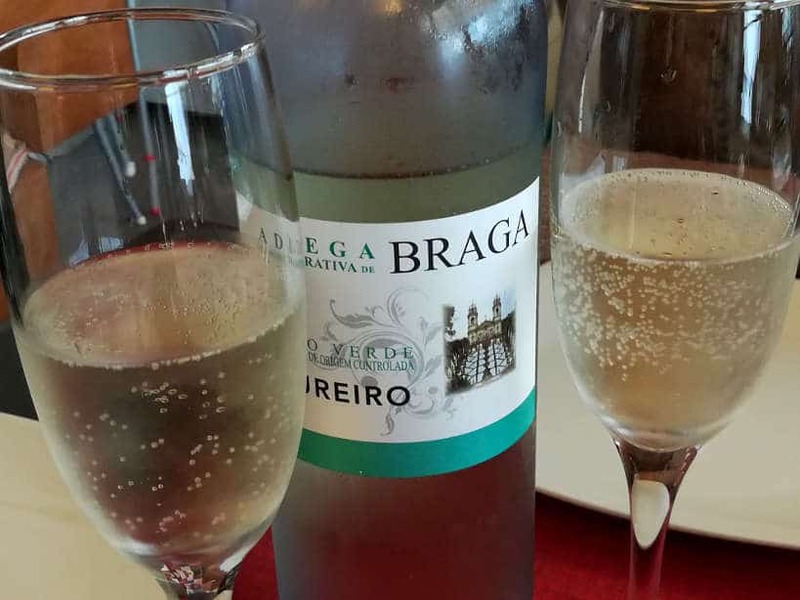 It is a place to taste Lisbon like nowhere else… “because if it works in Campo de Ourique, it will work everywhere in Lisbon”. To help us navigate this neighborhood, we teamed up with Taste of Lisboa to get a local experience and learn about Portuguese cuisine. After all, the best way to learn about a new culture is through food, and there is no better way than to do with a local. 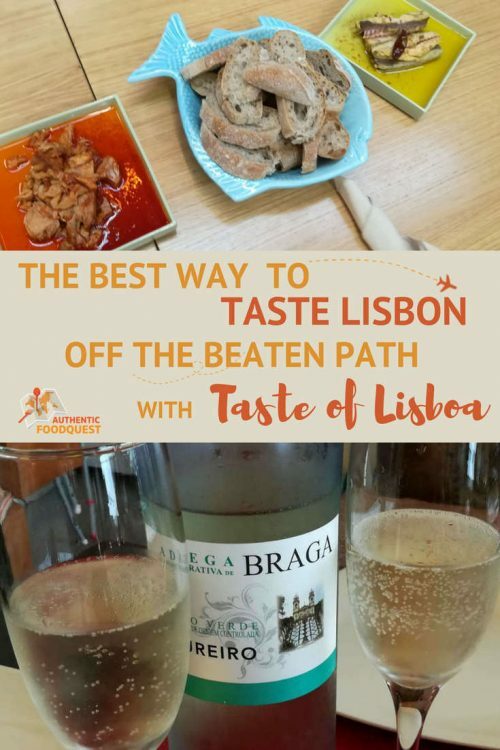 Join us on an off the beaten path food and wine tour with Taste of Lisboa for their Tram 28-Campo de Ourique Food & Cultural Walk Food Tour. The food tour started promptly at 10:30 am. 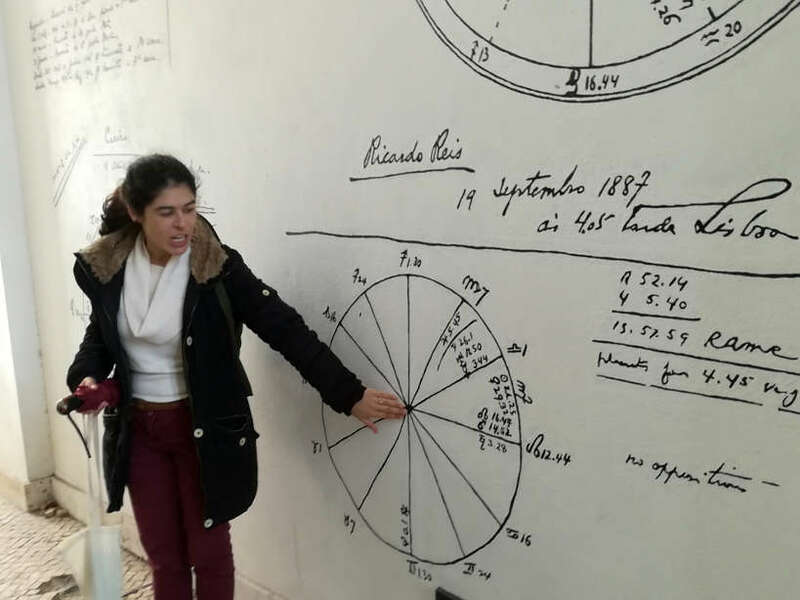 Guiding us was Madalena, who is Portuguese and lives in Estrela, the neighborhood right next to Campo de Ourique. The group was small and intimate, with a couple from Australia, a French lady and the both of us. The perfect size for a personalized experience. 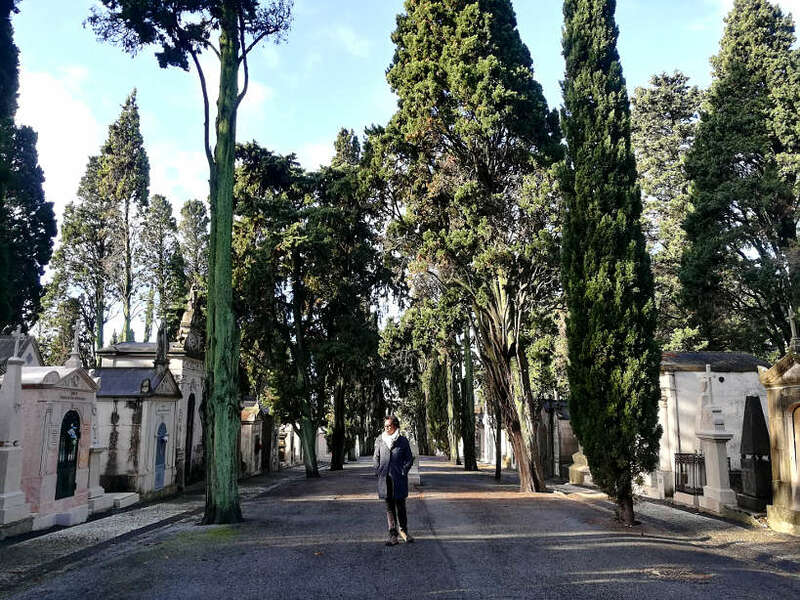 The meeting point was Cemitério dos Prazeres, where the most important and famous Portuguese personalities are buried. This includes writers, painters, actors, and singers. Created in the 1800’s to handle the thousands of victims of the cholera epidemic, it is filled with amazing sculptures and beautiful mausoleums. Our first tasting stop was a surprising start. 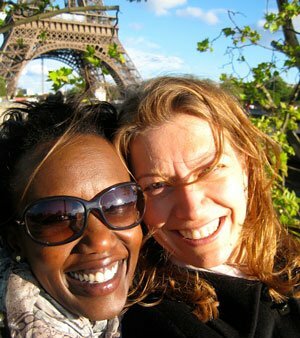 Our guide, Madalena, took us to discover the “best chocolate cake in the world” at MBCM. This tiny store is located at the back of the Mercado Campo de Ourique. And there are only a handful of tables to sit and enjoy this famous chocolate cake. You have the choice between the traditional cake which is made with milk chocolate cake or the dark chocolate cake, made with about 70% cacao. Both cakes are made of a light chocolate meringue combined with a rich chocolate mousse. At the first bite, you get an infusion of rich chocolate. The chocolate is refined and delicious with the mousse melting in the mouth. The meringue adds crispness and lightness to the cake. To accompany the cake, we enjoyed a traditional Portuguese coffee called bica. This espresso coffee helps cut the sugary taste of the cake. 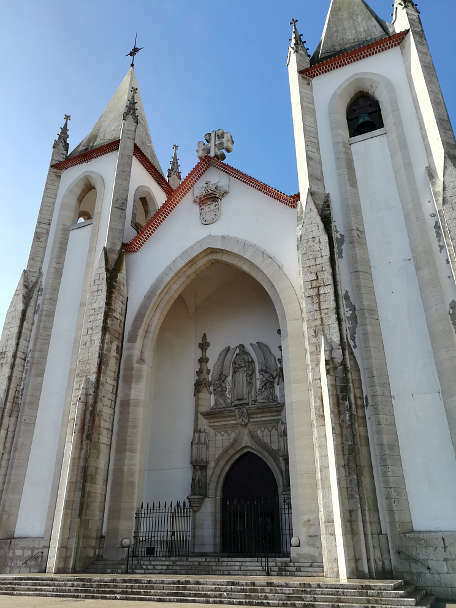 To digest our first stop of the day, we walked to the Igreja do Santo Condestável for a bite of history before heading to our next stop on the tour. Canned fish is an important part of Portugal’s culinary heritage, from as far back as 1853, when the first commercial canning factory, Ramirez, was set up. 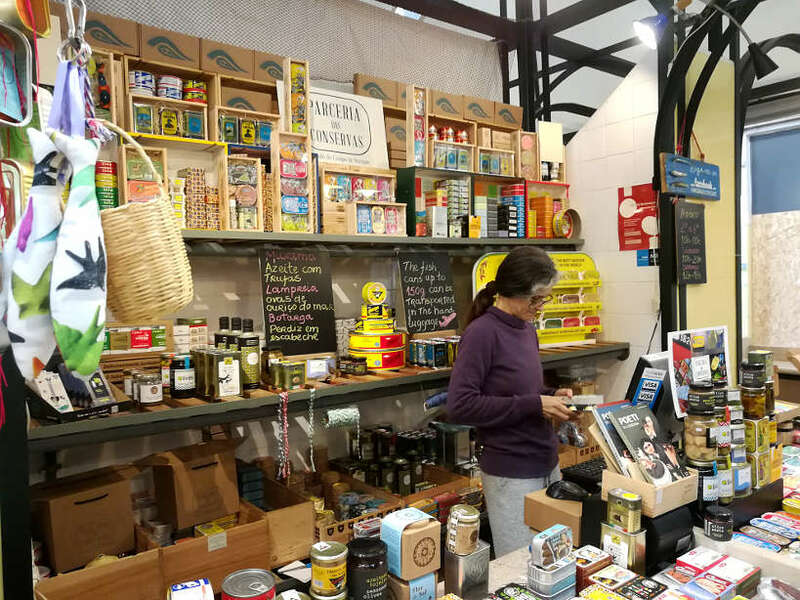 At Mercado Campo de Ourique, the main local market in the neighborhood, we made a stop at Parceria das Conserva to sample a variety of Portuguese canned fish. We sampled mackerel in curry sauce, Tuna in a tomato sauce, sardines in olive oil and a fish roe salad. These little bites were accompanied with a delicious rosé wine from Lisbon. The canned fish were surprisingly delicious. Both the mackerel and tuna were thick and fleshy. The curry sauce and mackerel was our absolute favorite. A hint of spice and the perfect combination of flavors. 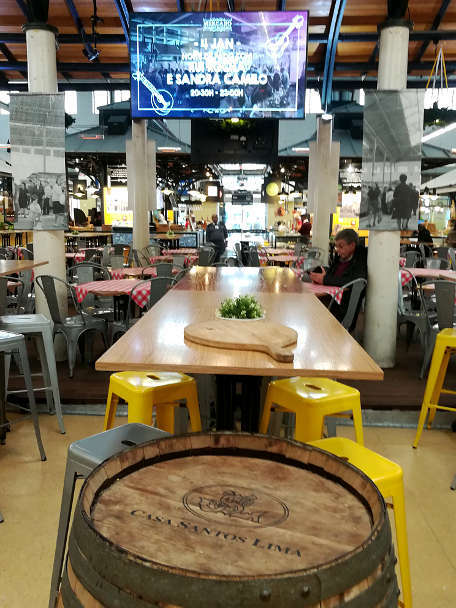 The venue, Mercado Campo de Ourique, was recently updated and transformed into a modern and hip market with traditional fruits and vegetables alongside stalls serving sophisticated Portuguese cuisine, wines, meats, Petiscaria or Portuguese tapas and more. A great historic place to taste Portugal in a relaxed environment. Pork is a consistent element in Portuguese cuisine. At Pigmeu, everything is prepared and cooked with pork. To get a taste of the cuisine, we were presented with a trio of their specialties. First, a “croqueta”, which is a fried bowl filled with pork cheek, with a mustard sauce. Then, we had a bruschetta made of “chicharron” or fried pork fat with tomatoes on top. And finally, a smoked ham sandwich. The sandwich was delicious, while the bruschetta had interesting flavors. The croqueta was our least favorite. To accompany these bites, we had a juicy red wine from the Douro valley. 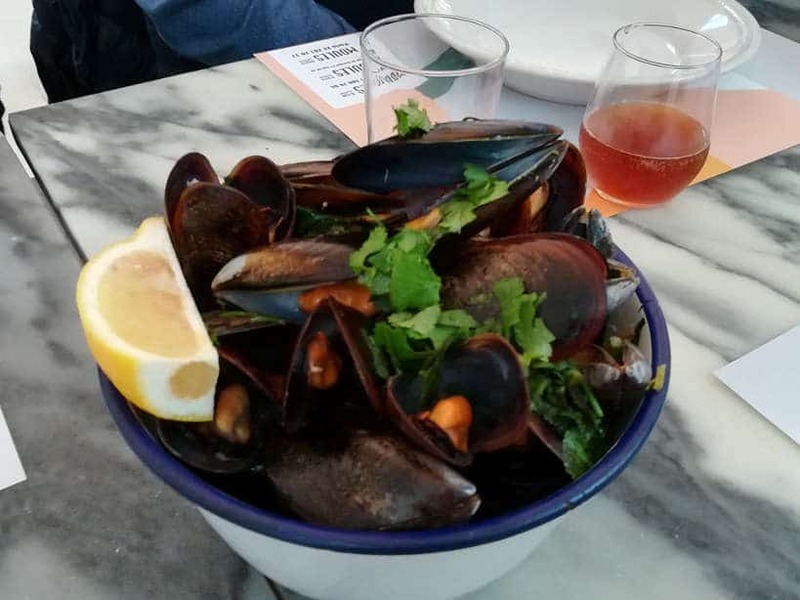 When it comes to beer and mussels, you may think of Belgium and certainly not Lisbon for traditional mussels and beer. 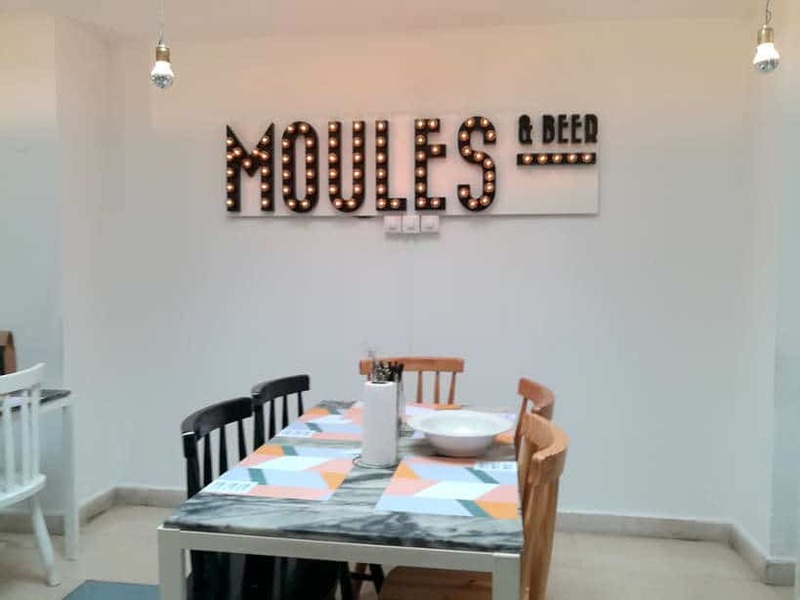 At the reinvented Moules & Beer restaurant, we got a chance savor local Portuguese mussels as well and craft beer from Lisbon. Two buckets of Portuguese Mussels were presented to us prepared with a typical Portuguese sauce called Bulhão Pato. The sauce gets its name from a famous Lisbon poet from the 19th Century. The sauce is made of white wine, cilantro, garlic, and olive oil, a good representation of the traditional Portuguese cooking ingredients. In addition to the Portuguese mussels, we tasted the local craft beer Vadia. This brewery was created in 2007, at the beginning of the new craft beer movement in Portugal. The Vadia we tasted was a lager, easy to drink and light in taste. The history and culture of Portugal was very much a part of the food tour experience. This stop for Portuguese traditional cuisine took place at restaurant Flagrante Delitro of Casa Fernando Pessoa. Fernando Pessoa is one of Portugal’s most celebrated poets and literary figures. Madalena regaled us with stories of studying Pessoa as a student and his “heteronyms“, or imaginary characters. The traditional tasting at this stop was for Pataniscas or codfish fritters with a baked beans soupy rice. This was accompanied by a glass of Vinho Verde or “green wine” from the rolling hills of northern Portugal. Despite being fried, the codfish fritters were not oily and full of flavors. The soupy rice with baked beans was the perfect dish for a cool day and the lively Vinho Verde was the perfect compliment to the tasting. To finish on a sweet note, we headed to Cantina da Estrela, housed within the historic Condes de Paraty palace. This restaurant, part of the Hotel Estrela, is modern and stylish, overlooking the beautiful garden. The perfect setting for an afternoon snack and drink. 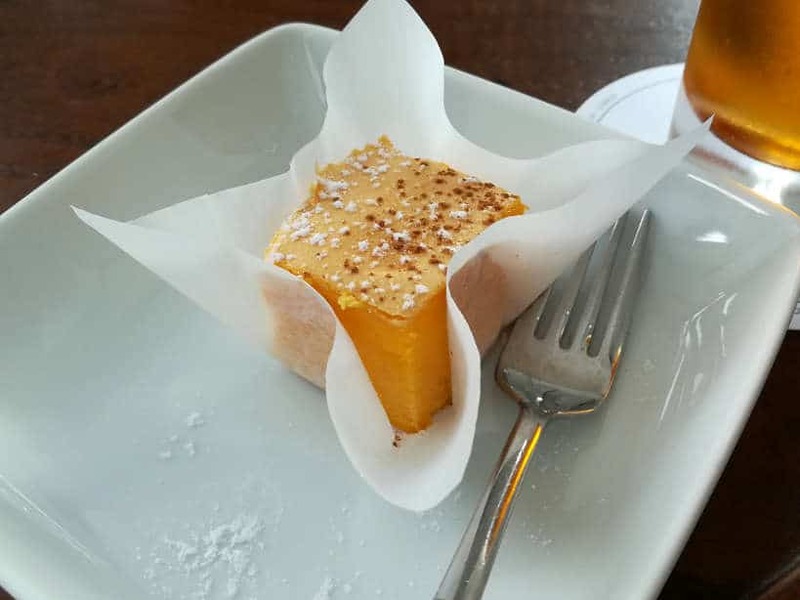 The local specialty here is the famous and very traditional Pão de Ló or Portuguese sponge cake. This sponge cake was traditionally made by the nuns from the convent of Cós. It is said that The Pão de Ló was born from a mistake in the 19th century during the visit of the King. As the story goes, the King was visiting and in a hurry to serve him, the sponge cake was removed out of the oven too early. Everyone praised the taste of the cake, which turned out moist and filled with a delicious eggy cream. Since then, the way to make this cake has been preserved. On the Taste of Lisboa food tour, we found the taste to be as described. The texture of a sponge cake was very soft, sweet and eggy. It is an easy cake to enjoy with tea or coffee. Food is one of the best ways to truly understand a culture. Taking a food tour with a local guide gives you rich insights and perspectives that you otherwise would not have. If it has not been for the Taste of Lisboa, we probably would not have visited the Campo de Ourique neighborhood and discovered its rich food culture. Our expert guide, Madalena, not only covered the traditional Portuguese delicacies but also took us to the up and coming restaurants that are reinventing Portuguese cuisine. 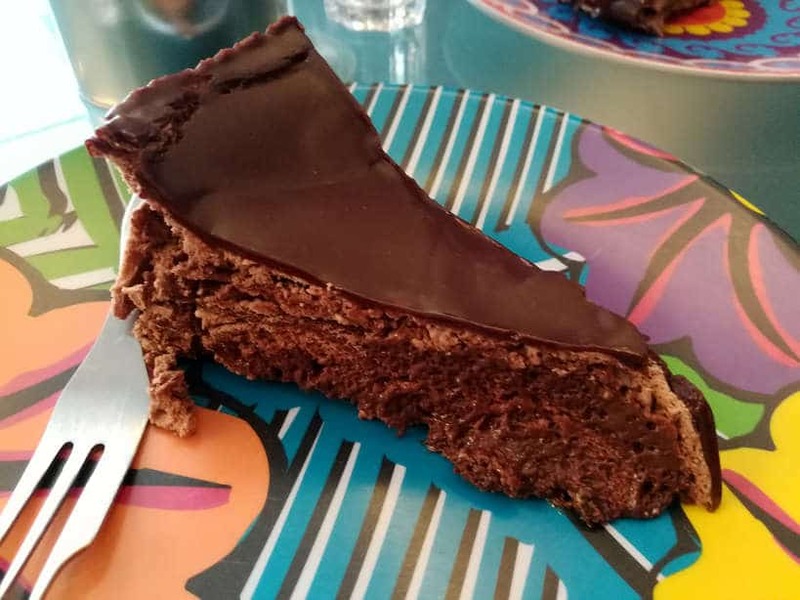 The discovery of the “best chocolate cake in the world” contrasted with the nun’s Pão de Ló covered a wide spectrum of the Portuguese desserts. From canned fish to mussels and codfish fritters we got a great sampling of Portugal’s favorite fish and seafood. 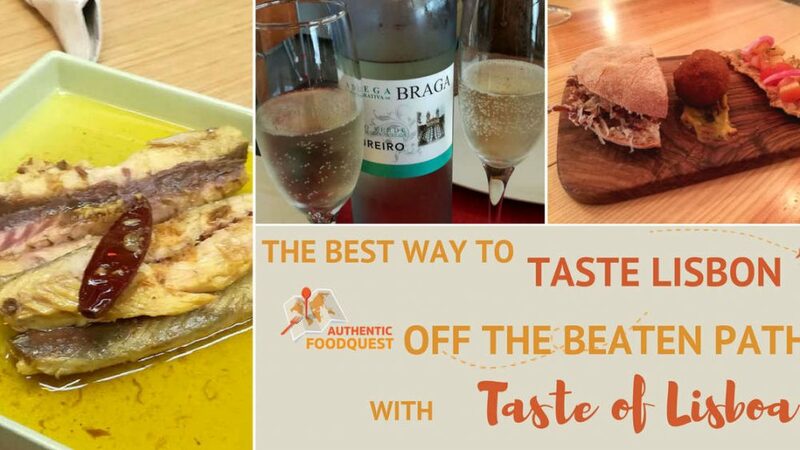 The Tram 28-Campo de Ourique Food & Cultural Walk Food Tour with Taste of Lisboa is a great way to discover a foodie neighborhood and learn about Portuguese cuisine. Taking the Taste of Lisboa food tour with a local gives you incredibly rich cultural insights. 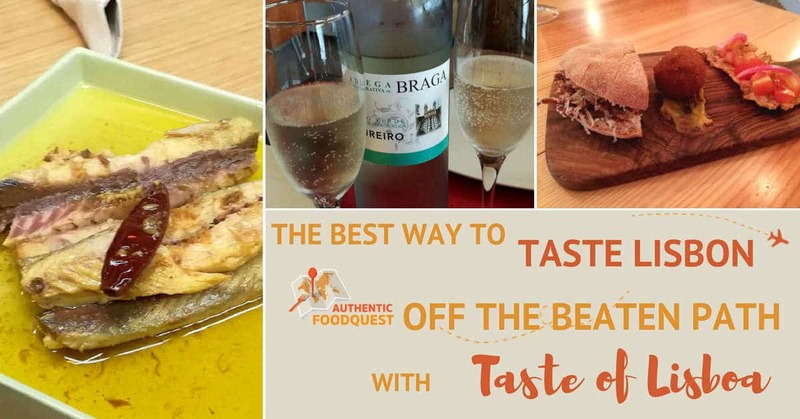 If your travels take you to Lisbon, be sure to book the Campo de Ourique Food & Cultural Walk with Taste of Lisboa, for a delicious discovery of Portugal. Created by a Lisbon native, the Taste of Lisboa offers a variety of gastronomy tours with a blend of history, culture, architecture in different neighborhoods. To learn more about the different food tours and experiences, visit the Taste of Lisboa website for more information. The particular tour we went on the Tram 28-Campo de Ourique Food & Cultural Walk Food Tour, was about 3.5 hours in length with seven food stops and a number of cultural stops as well. Don’t miss this off the beaten path food tour. Click here to book your Tram 28-Campo de Ourique Food & Cultural Walk Food Tour. Go with an open and curious mind and eat only a small or light breakfast. Be prepared for a fascinating discovery. With the Taste of Lisboa, you can expect “Real People, Real Food”! Special thanks to Taste of Lisboa for having us on this tour. All views and opinions expressed are our own. Full bellies and happy taste buds too! I’ve heard great things about this food tour before and your pictures make me even more excited to hopefully get to Lisbon one day! My blog partner is seriously into beer and was just there with friends, I will have to ask him if he tried the local mussels with beer there! And, mackerel in curry sauce??? Definitely one combination I wouldn’t have expected, but I have to admit I am a bit curious to try it! Thanks Erin and glad you enjoyed discovering unusual flavors such as mackerel and curry. Sounds odd, but tastes delicious. 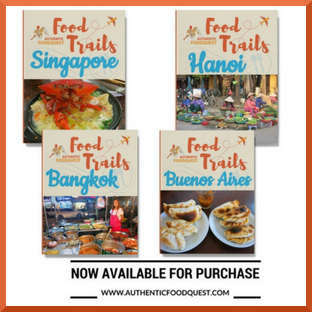 The next time you travel, do take a food tour, you will be amazed at what you will discover. Hopefully in Lisbon soon 🙂 Thanks for stopping by. I live in Panaji which calls itself the twin city of Lisbon. I wonder why I have not heard of Bica coffee here so far. Maybe I need to explore more. Love your first image of the cemetery – feels odd, but there is a haunting beauty to it. How would you rate Lisbon for vegetarians? Thanks Anu and glad you enjoyed the article. Actually for vegetarians, we’ve been surprised to see so many vegetarian restaurants. You would have plenty to eat:) Interesting to learn about Panaji the twin city of Lisbon. You probably have the same coffee with a local name instead of the Portuguese “bica.” Thanks for stopping by. That nuns sponge cake looks divine. Food tours are so worth the money because you try so many things! And they take you places you wouldn’t always make it to on your own. Looks amazing and its making me hungry. 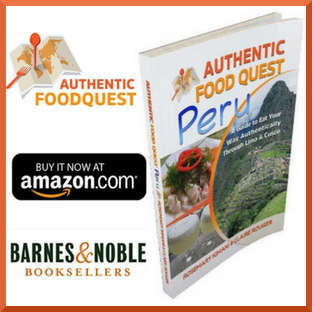 You are right Nicole, food tours get you to explore new areas you probably would have missed. In this case, we probably would not have made it to Campo de Ourique without the Taste of Lisboa. Glad you enjoyed the article and hope you make it to Portugal soon for the sponge cake 🙂 Cheers. Oh I love food tour! the best chocolate cake in the world? Wow! I’ve known cocoa or cacao as chocolates are made from them and we have it in our backyard! We used to devour its seeds and it’s tasty! Taste of Lisboa seems like a good one to book once you’ve visited this place! I love the seafood , Portuguese mussel here, too! Indeed, Taste of Lisboa offers an amazing experience. A look at the traditional and up and coming food scene in Lisbon. Highly recommend for your next trip to Lisbon!! Oh I hadn’t imagined a trip to Lisbon being about food. I am a foodie but I tend not like southeast Asian flavours more than European (no offense) except when it comes to desserts and cakes! I mean look at the nun’s sponge cake and the sinful chocolate cake, they’re to die for! I also like the look for the Portuguese mussels and the sardines in curry sauce. I think I’ll bookmark this post when I travel to Portugal so that I can refer to it easily! Awesome Medha, glad you enjoyed reading the article. 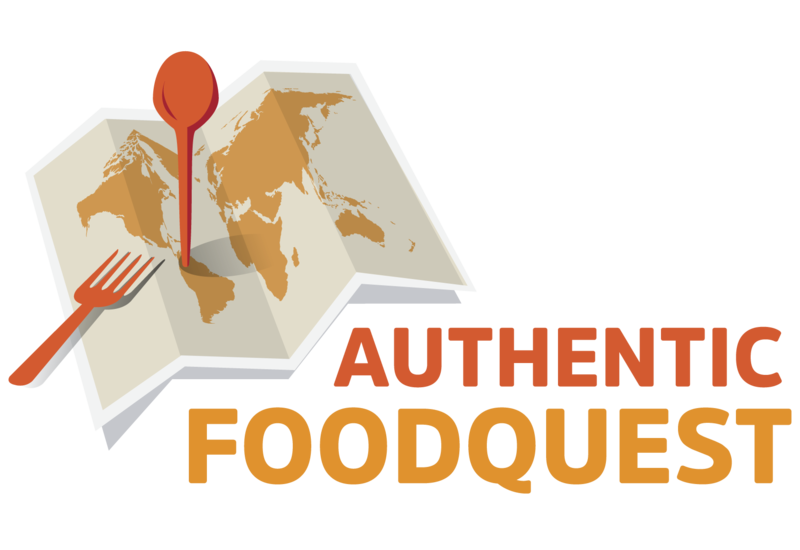 Don’t hesitate to reach out if you have questions about the food in Portugal. It is a delightful and underrated culinary destination. All the seafood is amazing, and the mussels and sardines are outstanding. Thanks for stopping by! 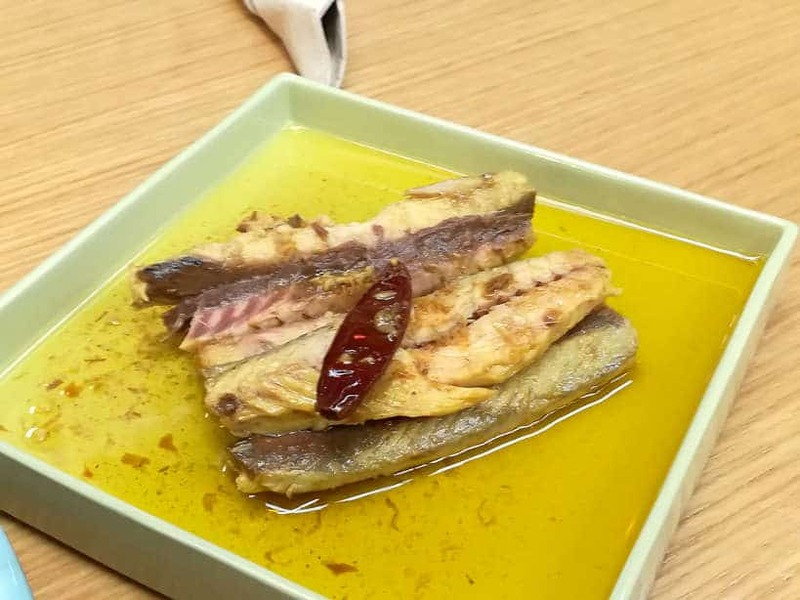 I’ll have to keep a mental note to try canned fish when I head to Lisbon – I had no idea it played such a huge role in Portugals culinary history. And honestly I wouldn’t have expected it to be so delicious! 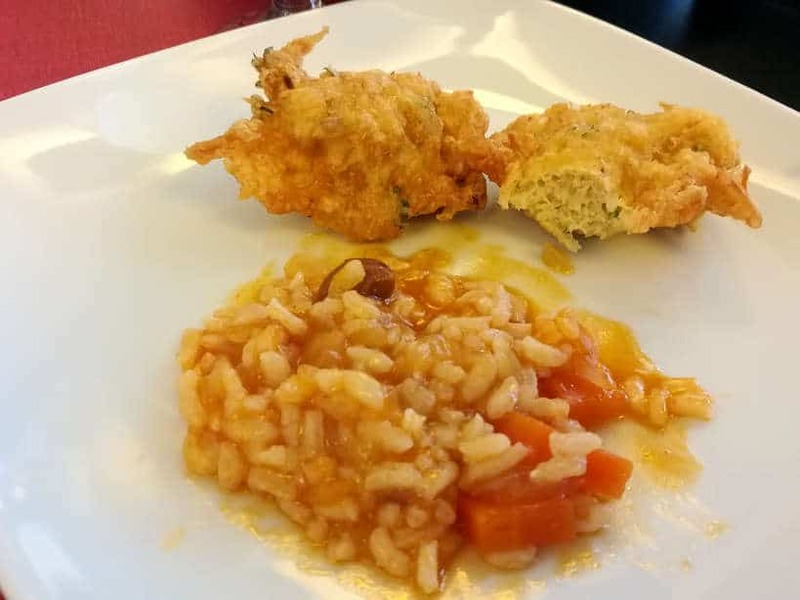 The Tram 28-Campo de Ourique Food & Cultural Walk Food Tour sounds like a fabulous way to gain insight into Lisbons history while sampling some amazing cuisine – thanks for sharing your experience! Hopefully I’ll have the chance to travel soon. Really hope you make it to Portugal soon. It is a beautiful country with outstanding seafood. 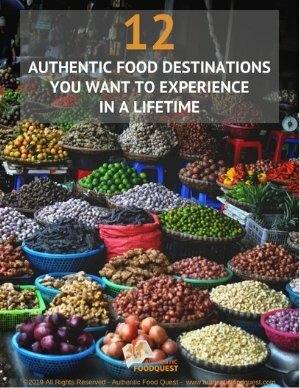 Totally agree, food tours are an amazing way to discover the local food culture. And, the Taste of Lisboa is the perfect culinary partner. Thanks for stopping by! I have not been to Portugal yet but have it on my list. 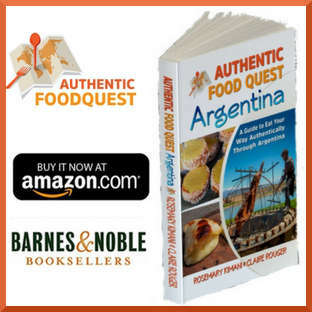 I just added this little food-town which is off the tourist map 🙂 I also agree that food is one important factor of any culture and I am interested always to find out the history of some of the local delicacies. Yes, I will go there one day! Hope you make it to Portugal soon Nisha. The amazing food is worth the trip coupled with the rich history of the country. There is truly no better way to travel than through food. Thanks for stopping by! I love the food in Lisbon, it is so tasty. I am a fan of the fried codfish and mussels are my go to meal in the Mediterranean. I have not tried a “croqueta” or the chocolate cake, so will we trying those when I’m in Lisbon next. Yay…another Lisbon food lover!! Truly the food is delicious and the city incredible. You will not be disappointed with the incredibly rich chocolate cake and croquetas. Let us know what you think!! Cheers. Was it really the best chocolate cake in the world?? It’s a tough call, I have tried a lot of delicious chocolate cakes! 🙂 I think that would be my favourite stop; I’m not a fan of tinned fish, but those mussels look yummy as well! Agree, Claire, best chocolate in the world was a tough call. We have to admit it quite delicious though. The canned fish in Portugal are unlike any other. I would highly recommend giving them a try. Can’t go wrong with good mussels though 🙂 Thanks for stopping by! I have to be honest and say I didn’t love Portuguese food when I visited Porto and Northern Portugal. And this food tour was a bit of a flip flop for me reading it. Dark chocolate cake? Sold! Canned fish? Blech. 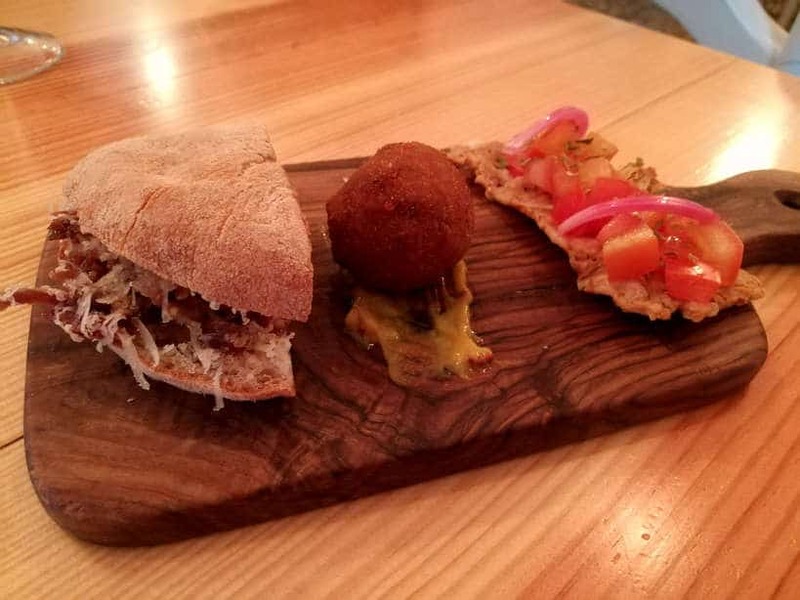 Pork croquettas and smoked pork sandwich? Yum! Mussels, yes please! Cod fritters? I could do without those and the rice. But I love food tours and there’s enough of the tastings that I’d still go on it, but pass up a couple of things while on it.